Don’t be limited by transport width. In just 30 seconds, our Road Friendly Transport option transforms the 13 foot R1 to a narrow 9 foot wide transport. 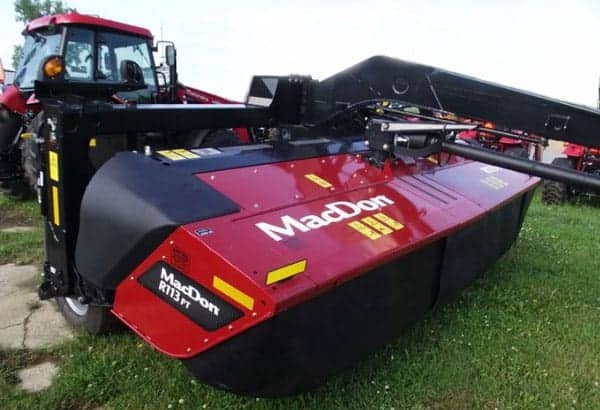 This allows for quick, safe travel to, from, and between fields. The all-new forward mounted cutterbar design provides a cleaner, smoother cut than ever before, and it’s backed by a 3 Year Cutterbar Warranty. No matter what the harvest situation or conditioning need, the R1 lays down well-formed, well-conditioned windrows. NEW MacDon R113PT- Only One Available! Our low profile forward mounted cutting discs provide a flat header angle resulting in a cleaner, smoother cut than ever before. And this new design is backed by MacDon’s 3 Year Cutterbar Warranty. That’s our way of ensuring worry-free harvesting performance. Using minimal ground pressure, our Responsive Float System moves the R1 “up and back” as it meets bumps in the field. This unique movement results in true, even ground following and helps ensure a clean, smooth cut.